The Honda WR-V is currently priced between Rs 7.79 lakh and Rs 10.26 lakh. The Maruti Vitara Brezza, which is the segment leader as far as sales are concerned, starts from Rs 7.58 lakh and goes up to Rs 10.33 lakh (all prices are ex-showroom*, Delhi). While we did compare the cars back to back a year ago, this time let’s see how their corresponding variants fare against each other. The Honda WR-V is only slightly longer than the Maruti Brezza yet it has a substantially longer wheelbase and offers more space in the boot as well. The Brezza meanwhile is wider and taller. The Maruti Vitara Brezza is powered by the same 1.3-litre diesel engine that is used across a wide range of Maruti cars, and offers a 5-speed AMT option as well. 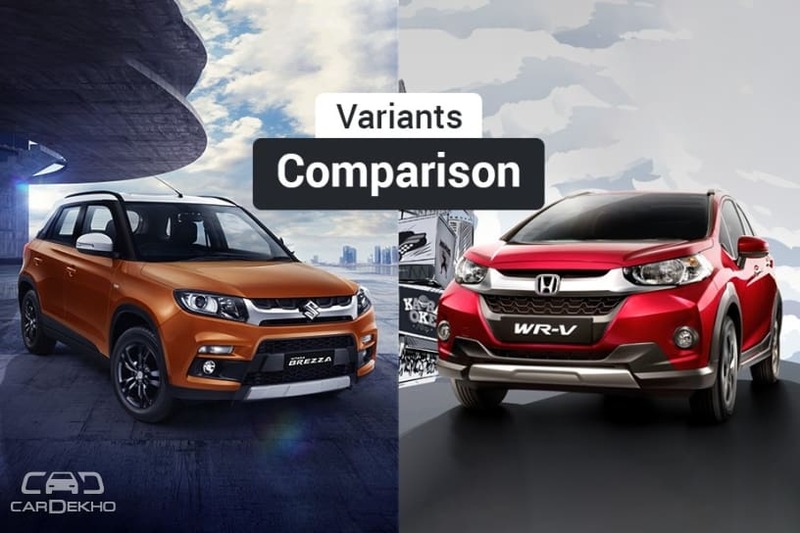 While the Honda WR-V is offered with both petrol and diesel engines, we are only looking at the latter for the comparison. It is slightly more powerful and has a 6-speed manual but no automatic transmission on offer. *All prices have been rounded off to the nearest thousand. Verdict: The Maruti Brezza is clearly the better choice here thanks to the safety, comfort and convenience features that the Honda WR-V miss out on. Note: Honda is currently offering a special festive variant called the Alive Edition over the WR-V S variant at a premium of Rs 33,000. It gets additional features like alloy wheels, rear view camera with IRVM display and parking sensors. Verdict: While the Honda WR-V commands a significant premium over the Maruti Vitara Brezza, it also offers features that the Brezza doesn’t, like an electric sunroof and telescopic steering adjustment. Factor in the value that these features together can offer to someone who needs them and the WR-V’s incremental cost can be justified. But for everyone else, the Brezza would be a more logical choice. There are some features exclusive to the Brezza, like rain sensing auto wipers and auto headlamps, and it’s also more affordable than the WR-V. The Brezza will also be the better choice for a young family thanks to features like the ISOFIX child seat restraint and rear centre armrest.